Commentary: Mizzou Football And The Power Of The Players Frank Deford wonders: Once the games are over, are the football players really accepted, or are they just hired hands? 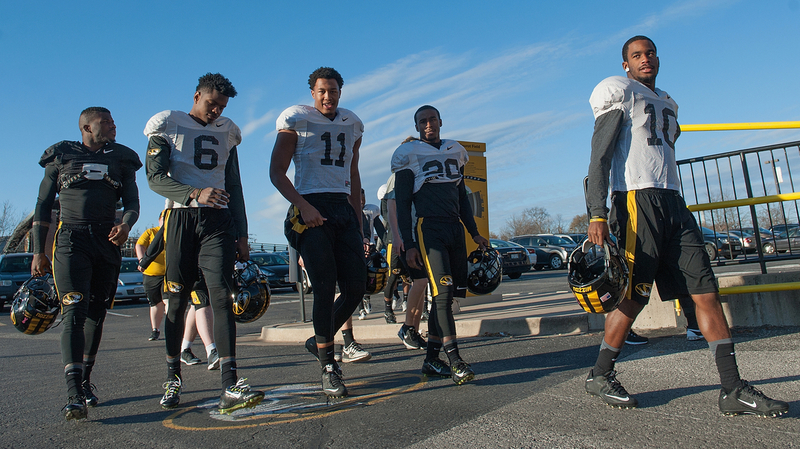 Members of the University of Missouri Tigers football team return to practice Nov. 10 at Memorial Stadium in Columbia, Mo. It's accepted that the president of the University of Missouri stepped down in a racial dispute only when the football team threatened not to play a game. The players showed us again — surprise, surprise — how powerful is football, and let's throw in basketball, too, throughout our bastions of higher education. It would have cost old Mizzou a million-dollar penalty had it forfeited. It would have cost the players next to nothing, because the NCAA rules they must be amateurs and risk serious injury for the love of the game. Ironically, for once, having nothing to gain actually strengthened the players' hand. The particular racially insensitive issues at Missouri and those that've produced protests at other colleges have nothing to do with sport, but, on the other hand, it's worth noting well over half of the football players who bring in the big money in the big-time conferences are African-American. The percentage of minority basketball players is even higher. Click the audio for Frank Deford's full commentary on this issue.